Good afternoon. I am delighted to join you for the ninth annual Innovation and Technology Scholarship Award Presentation Ceremony. This is a happy occasion for all of us. Beginning, of course, with the 25 splendid young men and women who have been selected as this year's IT Scholarship Award winners. They are all undergraduates coming from six universities and a wide range of programmes in science, medicine and engineering. Their purpose, dedication and pursuit of knowledge have been recognised, and I have no doubt that this award will mark a fresh milestone in their quest for excellence. The universities are no less worthy of recognition. They serve the students with a distinction driven by commitment and pride. And, clearly, they have instilled in each of our award winners a culture of learning steeped in innovation and technology (I&T), grounded in scientific research and critical thinking. I am as delighted as anyone here, including of course the parents. After all, my Government is committed to nurturing Hong Kong's rise as an international innovation and technology hub. And we can't do that without our world-class universities and our world-class students. My Government's role is to help enable their success through our policies, initiatives and resources. We help, as well, by proactively pursuing desired goals for our economy and our community. Which is why, in my Policy Address last October, I pledged HK$20 billion to the Research Endowment Fund under the University Grants Committee. These funds will strengthen the research capabilities of our universities. My Government also set in motion a scientific research matching fund of HK$3 billion to further boost research funding through contributions from the non-public sector. I look forward, as well, to proposals for the City I&T Grand Challenge. 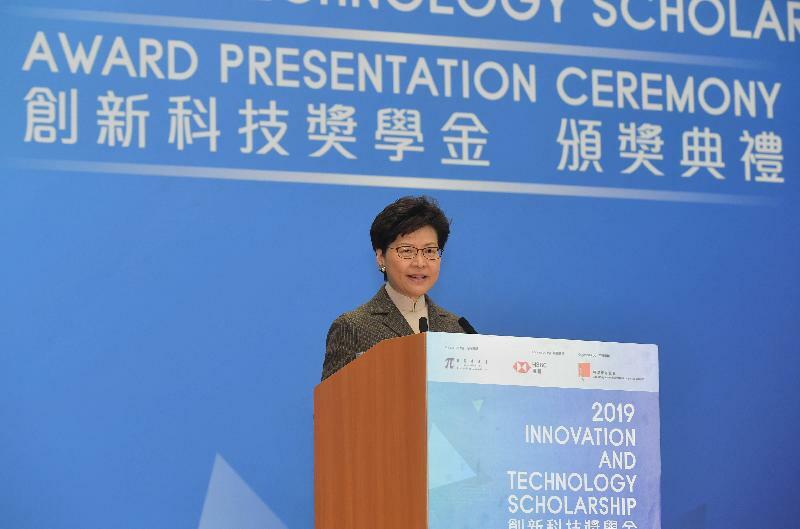 As outlined in my Policy Address, my Government has allocated HK$500 million over the next five years for this annual competition, which seeks to encourage our people, students included, to apply I&T to tackle issues and challenges related to our everyday lives. I'm sure many of our students here today have some smashing thoughts and grand ideas on improving our daily lives. Our Grand Challenge welcomes them. The bigger challenge, of course, is ensuring Hong Kong's continuing success in the years and decades to come. An international innovation and technology hub to be developed in the Guangdong-Hong Kong-Macao Greater Bay Area will help get us there, through supporting policies from the Central Government and efforts of the three governments. I am confident that the 25 young men and women we are honouring today will play a vital role in realising the promise of innovation and technology development in Hong Kong. My thanks to the Hong Kong Federation of Youth Groups, the organiser of the Innovation and Technology Scholarship Award since its inception in 2011. I am grateful, as well, to the Scholarship's supporters - the Innovation and Technology Commission and HSBC - and its I&T mentors and the companies providing internships for our award-winning students. In supporting the Scholarship, you help build Hong Kong's future. Finally, to the 25 inspiring young men and women whose lives and horizons are about to expand, I wish you all the success in your future endeavours. Thank you very much.